One minute you have a healthy, beautiful baby boy. The next, you have a child with a complex, incurable disease. That is the fate of tens of thousands of parents across the United States, where type 1 diabetes afflicts about 1.25 million children and adults. Tucsonans Rosi and Ben Vogel took their 2½-year-old child, Daniel, to the doctor because he’d been very thirsty, wet right through his diapers and crib padding, wasn’t eating and had a persistent cold. “These are classic signs – but we had no idea that a baby could get diabetes, so we didn’t think about it,” Ben Vogel said. When Daniel was diagnosed by his pediatrician, he was rushed to the hospital in an ambulance. His blood sugar level was 400 milligrams per deciliter. A random blood sugar level of 200 is enough to indicate the presence of diabetes. Rosi took the news particularly hard. “For her it was crushing. It was devastating,” her husband said. Formerly known as juvenile diabetes, the ailment affects children and adults and cannot, like type 2 diabetes, be abated with lifestyle changes such as losing weight and exercising. Type 1 diabetes accounts for about 5 percent of all diagnosed cases of diabetes. Its complications can be deadly and include heart disease, kidney disease, blindness, stroke and lower-limb amputation, according to the Diabetes Research Institute. The autoimmune disease happens when the pancreas stops producing insulin, which controls blood-sugar levels. The Vogels had to prick their baby’s finger to test his blood sugar six to eight times a day and give him insulin injections three to five times a day. “We were told early on by one of the people who was training us at the time that diabetes was not a death sentence, but it was going to change our lives. Daniel’s life was not going to be the same,” Ben Vogel said. Vogel is now part of a unique, all-volunteer group – the Father’s Day Council Tucson – which raises money to combat the disease. Since 1994 it has donated $4.3 million for research, education and patient care at the Steele Children’s Research Center at the University of Arizona. Dr. Fayez K. Ghishan is director of the Steele Center and physician-in-chief at Diamond Children’s Medical Center. He’s worked closely with the Father’s Day Council Tucson since its inception. Steele Center’s Angel Wing serves more than 1,000 pediatric patients, cared for by doctors, researchers, nurses, nutritionists and counselors. After a few years of research funding by Father’s Day Council Tucson galas, Angel Charity for Children joined the cause and raised more than $800,000 to create and build the Angel Wing at Steele, according to the UA. This year marks the 25th anniversary of the council and its gala, which raises money while honoring a half-dozen exemplary fathers. The event is June 1 at Loews Ventana Canyon. Steve Rosenberg, BizTucson’s publisher, founded the Father’s Day Council Tucson. It is modeled after a nonprofit that his father, Howard Rosenberg, established in Los Angeles. “Twenty-five years ago, there was not a single type 1 diabetes research project in Southern Arizona. The region only had one pediatric endocrinologist. Many parents needed to take their kids to Phoenix for any type of treatment and ongoing care. That all changed with the Father’s Day Council Tucson,” the younger Rosenberg said. Producing a successful awards gala is the result of “a ton of work behind the scenes by some extremely dedicated Father’s Day Council Tucson board members,” he said. The elder Rosenberg was the chairman and driving force behind the Father’s Day Council Los Angeles, which held annual Father of the Year Awards luncheons. By expanding the National Father’s Day Council in 34 cities throughout the United States, he helped raise more than $50 million for diabetes research. He died in July 2013 in Los Angeles, years after he helped his son get a nonprofit and fundraiser going in Tucson with the help of friends, family and colleagues. The first gala, in 1995, sold out. “It was all-hands on deck as this very small group of volunteers produced an amazing event that everyone was talking about,” Steve Rosenberg said. The Vogels have long been immersed in Father’s Day Council Tucson – Ben since 2006 and Rosi a few years later. They reached the doctor on call at the Angel Wing, and he confirmed that Jonathan did have diabetes. This time around the Vogels knew what to do. Steve Rosenberg’s son, Matthew, was on Jonathan’s Little League team, and Rosenberg asked fellow coach Ben Vogel to join the council’s board. Researchers and the Vogels have learned a lot about type 1 diabetes since the day Daniel was diagnosed. Daniel now has an insulin pump, and both boys have continuous glucose monitors. They’re both studying engineering at different colleges. “It doesn’t have to be limiting. With all of the wonderful work that’s being done around the world with diabetes research and technology, people with diabetes can do anything they want to do,” Vogel said. 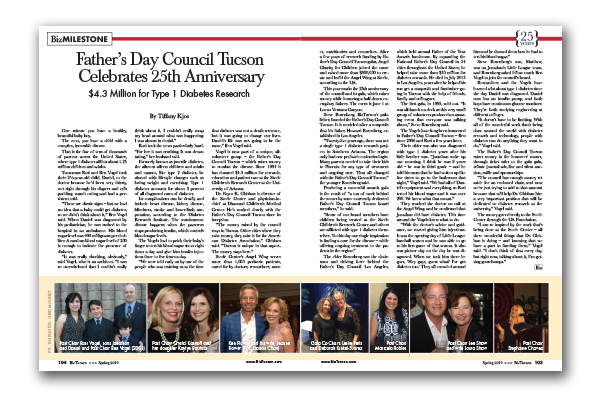 The Father’s Day Council Tucson raises money in the honorees’ names, through ticket sales to the gala gala, tribute journal ads, live and silent auction, raffle and sponsorships. “The council has enough money set aside for an endowed chair, and now we’re just trying to add to that amount because that will help Dr. Ghishan hire a very important position that will be dedicated to diabetes research at the university,” Vogel said. The money goes directly to the Steele Center through the UA Foundation.